Dip: Mix with 8 ounces of sour cream. Refrigerate for 10 minutes, stir and enjoy! ARIZONA SMOKEY HABAÑERO DIP MIX - This is our dip made to really spice up your life! We combined the delicious smoky flavor or Red Jalapeño Chipotle and the heat and flavor of Brown Habañero to bring you this fiery goodness. 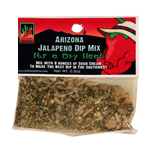 ARIZONA VEGETABLE DIP MIX - A milder version of our Jalapeño Dip, with various herbs and spices. ARIZONA SMOKED HEAT DIP MIX - A milder, smoky blend of Ancho, Red Jalapeño Chipotle, herbs and spices. ARIZONA SWEET HOT DIP MIX - If you’re looking for a taste of chile and sweetness, try our mild dip made with New Mexico, Red Chile, brown sugar, herbs and spices. HOT. ARIZONA CHIPOTLE DIP MIX - A smoky, medium heat dip made with our signature Red Jalapeño Chipotle dip, herbs and spices.